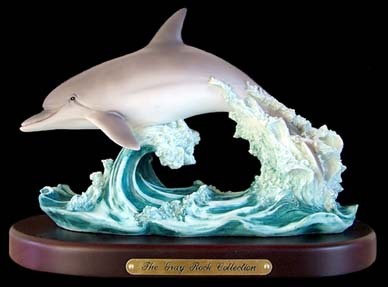 This unique Dolphin Sculpture displayed on a wooden base is handcrafted from the highest quality materials, then beautifully hand painted in natural color. Our goal is to bring the highest quality artworks into your home or office. This art piece is handcrafted to the finest detail to ensure "ART GALLERY QUALITY at BREAK THROUGH PRICES."